Andrew McManus started a Bachelor of Business: Information Systems at the University of Ballarat in 1988, graduating in 1991. 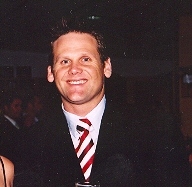 As a middle distance athlete, Andrew McManus, was named Australian Athlete of the Year and Australian Middle Distance Athlete of the year in 1996, beating Olympians such as Catherine Freeman and Dean Capobianco for the award. He has won many foot races including the 800m at Stawell, the Bay Sheffield 1600m, the Maryborough 1600m, the Geelong 550m and the Burramine 400m. McManus represented Australian in the 2004 Olympics. This biography was researched by Clare Gervasoni, May 2008.